Let me make it clear, I like genre books – horror, sf, fantasy. If it doesn’t have a spaceship or a paranormal creature I am unlikely to read it. And yet a couple of years ago, Carys Bray drew me into her slightly askew world with her short story ‘Sweet Home’, a very English take on the story of Hansel and Gretel. A further unforgettable encounter with her prose, in ‘The Baby Aisle’, prompted me to buy her short story collection ‘Sweet Home’, and then I was hooked. This woman’s work gets under my skin. She writes about families, the kind of family we all know, or are part of, and she writes with absolute, unmerciful, unswerving truth. But this isn’t misery lit, it’s a view of real life from the point of view of someone who knows how to love and what it means to grieve. I wasn’t surprised to hear that her first novel, ‘A Song For Issy Bradley’ had been the prize in a bidding war last year, and it’s been on my ‘must read’ list ever since. The book expands on one of the ‘Sweet Home’ short stories (Scaling Never), and because of this, I don’t feel that I’m letting loose a spoiler when I tell you that it’s the story of a family falling apart after the death of one of their children. I was expecting this foreknowledge to spoil the first few chapters, but Bray’s use of multiple viewpoints puts the focus on the protagonists’ lives so deftly that I wanted to know how they would react to the forthcoming death of little Issy, and how they would cope. I was impressed, and considered myself to have been taught a lesson on how a good writer deals with an unavoidable spoiler in a novel. This book is not about a death. It may make you cry, but it is just as likely to make you laugh in recognition or in sheer delight. This book is about a family, and how they relate to each other and the wider community. It’s a family that has taken for granted its unshakeable unity, and its place in the heart of a small religious community in the North West of England. Issy’s death strikes a deep blow to the centre of the family, fissuring the cement that holds the Bradleys together, and as the story unfolds, we follow the increasingly separate journeys of mum Claire, dad Ian, teenage oldest sister Zippy, middle child Al, and young Jacob, who is a true delight, if a bit of a puzzle, to everyone who meets him. The use of multiple viewpoints leads to amusing differences in how the five family members see the other characters in the novel. We get several different takes on other members of the church, absent relatives, and also the Church of Latter Day Saints itself, which is so integral to the story it’s almost another character. Each family member reacts in a different way both to Issy’s death, and to the wave of grief following such a massive loss. Jacob, the nearest in age to Issy, is particularly beautifully drawn. Jacob lives in a world of stories, a mixture of fairy tales, Bible stories and stories from the Book of Mormon. The church he has grown up in is keen on the concept of miracles, and it’s not surprising that he decides that what the Bradleys need is a miracle. In his own pragmatic fashion, he sets about creating one. As each of the Bradleys copes with Issy’s death in their own way, they drift further apart, some struggling to make things right, others wondering how things can ever be right again. As their individual lives each reach a crisis or an enlightenment, they are drawn back together for what could be the miracle they all need. 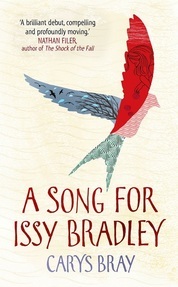 ‘A Song For Issy Bradley’ is out in June, published by Hutchinson. This entry was posted in Non fiction, Review and tagged Fiction, love, review. fantasy, writing. Bookmark the permalink.